Chances are, you’re reading this review on an example of disruptive technology. An iPhone or other smartphone. An iPad or a notebook computer. Or simply a laptop. Every one of these devices turned its industry upside down when it was introduced, driving established companies to the brink of insolvency, or even into oblivion, and paving the way for new actors to enter the landscape.Today, almost instinctively, we understand the concept of disruptive technology. But it wasn’t until after the publication in 1995 of an article by Clayton Christensen in the Harvard Business Review entitled “Disruptive technologies: catching the wave” that the term entered the language. That seminal article was followed in 1997 by Christensen’s pathfinding book, The Innovator’s Dilemma – one of the most influential business books of all time.Christensen, a long-time professor of business administration at the Harvard Business School, had found an answer to a question that had long mystified the business community: why had such iconic, well-managed firms as Digital Equipment Corporation, Xerox, and dozens of others that had long led their industries fallen by the wayside? The professor’s answer was not that they had simply gotten behind technologically but that they had done everything right — listening carefully to their best customers and catering to their needs by investing in sustaining technologies that offered customers added value. The problem was that the dictates of prudent business practice prevented them from investing in the sort of innovation that could turn their own industries upside down: disruptive technologies. In fact, Christensen wrote, “the only instances in which mainstream firms have successfully established a timely position in a disruptive technology were those in which the firms’ managers set up an autonomous organization charged with building a new and independent business around the disruptive technology . . . There is something about the way decisions get made in successful organizations that sows the seeds of eventual failure.”A decade and a half ago this was a shattering insight and it explains the acclaim that Christensen’s work has received throughout the world of business. However, if you turn to his book, The Innovator’s Dilemma, in search of deeper understanding of these concepts, you may be disappointed. I was.Sadly, this book is organized and written in a style that reeks of old-fashioned academia. Chapter One, an introduction of sorts, sums up the book as a whole — in 26 tedious pages, explaining in detail what the reader will find, chapter by chapter. First, Chapter One briefly outlines what the book will reveal, then proceeds to repeat each point in detail. Then, as though that isn’t enough, each chapter repeats the same points, adding considerably more detail. The final chapter repeats each of the major points — again. The repetition is maddening. And so is the overuse of the passive tense, which abounds throughout. Compounding the problem are the long-winded explanations of such things as how disk drives work and the distinction between thin-film technology and ferrite-oxide technology in disk drives’ read/write heads. All this material, no doubt necessary to “prove” Christensen’s thesis to his academic peers (some of whom are still not convinced), gives the book the charm and box-office appeal of a PhD dissertation about the influence of the Greek concept of the soul in 13th Century French literature.If all you want is to get to the meat of this book and avoid slogging through endless detail about matters only an engineer could love, read the first chapter and the last one. Forget the rest. You’ll thank me. This is a great book on innovation and how start-up and entrepreneurs ought to fashion their company to go against entrenched incumbents.The gist of the book is an interesting trend the author found when analyzing the industry. He found that certain innovations were "disruptive" -- meaning they changed the way a market worked, and some were "sustaining" -- meaning they were really just improvements on existing products.The author traces disruptive innovations through the steel industry, where it took $100M + to build an integrated steel mill. Someone one day discovered a way to make steel with a much cheaper furnace -- a "mini-mill". This mini-mill made steel that was ugly and weak, compared to the integrated steel mills -- but it was good enough for one type of steel: rebar. It could make rebar about 10x cheaper than the integrated steel mills, and it didn't matter that it was ugly.The integrated mills could not compete with the mini-mill due to costs. But, more importantly, they did not *want* to compete. Rebar was the lowest quality of steel, the most commoditized, and the customers were the least loyal and most price-sensitive (read: difficult). They were happy to walk away from that business...they really made no money in that market anyway. So the mini-mills experienced almost no competition from the incumbant.After a few years the mini-mills all experienced decreasing profits due to more mini-mills entering the market. Soon, someone discovered how to make the next level of steel -- I forget what it was, elbow joints or something. The same cycle happened...the integrated mills walked away from a fight and the mini-mills saw huge profits for a few years until they all caught up.Slowly, innovation after innovation ended up eating away all of the business from the integrated mills -- who never once tried to compete for the business they were losing. Today there are no integrated mills in existence.This is the gist of the book: if you are going to create a new company, you ought to learn from history and fashion a product that will have the existing leaders gladly walking away from the business you are fighting for.Anyway, this is a long review. Great book, very thought provoking. This is one of the best books on innovation in the last 20 years. I read it in 2000 and still refer to it. Christensen's core insight/argument is that businesses fight shy of developing innovations that will 1: produce limit profits initially; 2: cannibalise core, high cashflow/profit lines. But that what look like niche technologies - Winchester drives, hydraulic backhoes, etc - improve in capability, reliability and reduce in price to the point that they entirely cannibalise the existing market, leaving the established players high and dry, with no new product lines. (In a way he is reposing the falling rate of profit thesis.) He suggests some rather less convincing solutions in the book, and expounded further in The Innovator's Solution: Creating and Sustaining Successful Growth. I would argue that Apple presents an interesting solution to this challenge, with its creation of new product lines that complement and build on - but, largely, don't cannibalise - its existing product lines. This book was on my list of "Books I should read" for a long time. Maybe this is why it was so disappointing, or maybe I've just read too many modern case studies of business models to find this engaging. It was interesting to read about the origins of many terms that I take for granted (i.e. disruptive technology), but I couldn't really relate any of the examples or theory beyond anything that's already been mentioned by other more recent authors. And its hard for a 20-something to relate to the modernity of disc drives. Clayton M. Christensen writes clearly and analytically, with lot's of examples and research, pleasure to read. Thoughts so logical you wonder how the managers/CXO's he talks about didn't figure this out by themselves already yesterday. A thought provoking read no doubt, even for those not in executive positions.It's not a 100%, but gets some future predictions right - fun to discover them 18 years later. And it's also interesting to use the frameworks described to think about new technologies that constantly keep surfacing on this Information Age we live in. "It is unclear how long the marketers at Microsoft, Intel, and Seagate can succeed in creating demand for whatever functionality their technologists can supply. Microsoft's Excel spreadsheet software, for example, required 1.2 MB of disk storage capacity in its version 1.2, released in 1987. Its version 5.0, released in 1995, required 32 MB of disk storage capacity. Some industry observers believe that if a team of developerswere to watch typical users, they would find that functionality has substantially overshot mainstream market demands. If true, this could create an opportunity for a disruptive technology - applets picked off the internet and used in simple internet appliances rather than in full-function computers, for example - to invade this market from below. "So essentially Christensen predicted Google Docs, Zoho Docs and similar products in the year 1997. Or if we stretch a bit, cloud services not present on our own devices, but on far away server rooms.Tenth chapter of this book is basically the manual for approaching electric vechicles as a disruptive technology - a manual for Elon Musk to build Tesla. :)Although the conclusion the author arrives is not Tesla Model S (a premium product), but rather a cheap and low range Mitsubishi iMiev or Nissan Leaf. Well, that's why you don't predict, but explore and try. "To measure market needs, I would watch carefully what customers do, not simply listen to what they say. Watching how customers actually use a product provides much more reliable information than can be gleaned from a verbal interview or a focus group. Thus, observations indicate that auto users today require a minimum cruising range (that is, the distance that can be driven without refueling) of about 125 to 150 miles; most electric vehicles only offer a minimum cruising range of 50 to 80 miles. Similarly, drivers seem to require cars that accelerate from 0 to 60 miles per hour in less than 10 seconds (necessary primarily to merge safely into highspeed traffic from freeway entrance ramps); most electric vehicles take nearly 20 seconds to get there. And, finally, buyers in the mainstream market demand a wide array of options, but it would be impossible for electric vehicle manufacturers to offer a similar variety within the small initial unit volumes that will characterize that business. According to almost any definition of functionality used for the vertical axis of our proposed chart, the electric vehicle will be deficient compared to a gasolinepowered car.This information is not sufficient to characterize electric vehicles as disruptive, however. They will only be disruptive if we find that they are also on a trajectory of improvement that might someday make them competitive in parts of the mainstream market. The trajectories of performance improvement demanded in the market—whether measured in terms of required acceleration, cruising range, or top cruising speed—are relatively flat. This is because traffic laws impose a limit on the usefulness of ever-more-powerful cars, and demographic, economic, and geographic considerations limit the increase in commuting miles for the average driver to less than 1 percent per year. At the same time, the performance of electric vehicles is improving at a faster rate—between 2 and 4 percent per year—suggesting that sustaining technological advances might indeed carry electric vehicles from their position today, where they cannot compete in mainstream markets, to a position in the future where they might."... "If present rates of improvement continue, however, we would expect the cruising range of electric cars, for example, to intersect with the average range demanded in the mainstream market by 2015, and electric vechicle acceleration to intersect with mainstream demands by 2020. "To which one living in 2015 can chuckle - Tesla Model S came out in 2012 and it definitely beats any average acceleration and range demands. Actually any electric vehicle in production accelerates like a mad horse.And a last piece for my memo: the parameters by which customers compare the products on the market (from left to right) FUNCTIONALITY - RELIABILITY - CONVENIENCE - PRICE.In a young market, functionality is almost the same for all products, then they will start looking at reliability to differentiate the product. If that becomes the same, they will look at convenience. And if the products have become all three, the last thing basically will be a price war. A good book, but a bit disappointing because totally centred upon business managing. I would like to see the discussion occurring at a lower level, the creative moment, before management decisions. Leave here the five principles stated by Clayton in the book. I generally agree with all of them, being the fifth one the most subjective. "Principle #1: Companies Depend on Customers and Investors for ResourcesPrinciple #2: Small Markets Don’t Solve the Growth Needs of Large CompaniesPrinciple #3: Markets that Don’t Exist Can’t Be AnalyzedPrinciple #4: An Organization’s Capabilities Define Its DisabilitiesPrinciple #5: Technology Supply May Not Equal Market Demand"
This is one of those books that becomes an instant classic. Everyone talks about it until you think you know most of what it has to say without reading it shortly after it comes out. You can barely carry on a conversation about technology without someone using the term "disruptive." It deserves that reception and as with most cases, there is much more to gain by reading the book than just the popular representation.The book defined disruptive technologies vs. sustaining technologies and addresses why good, established companies usually dominate and prosper with new sustaining technologies and often fail or are even displaced because of disruptive technologies. It shows how such companies can cope with the challenge to maximize their chances even though there are systemic biases against it given how an established company must approach resource allocation.In my own career, I'm generally in the place of the smaller companies that effectively utilize disruptive technologies rather than with large, established firms with that problem. It is equally valuable from that perspective because it sheds light on some of the advantages that are felt but perhaps not fully identified and guidance on how you might better exploit them.This book ought to be read by most people interested in business and certainly everyone occupied with computer technology. The subject of this classic is disruptive technology.With the help of many examples from industry (disk-drives being his main workhorse) the author explains what technologies are likely to disrupt, who is likely to be disrupted, why they are likely to be disrupted and what the choices are that the established players have when presented with disruption. The most important point is that disruption generally comes from the practice of repackaging and marketing already existing, straightforward technology at a lower price point to a new customer base that is not economically viable for the established players. For example, QuickBooks was marketed to mom-and-pop stores who could not afford to pay an accountant and it was the el-cheapo version of Quicken. It is of no use to a proper corporation. JC Bamford got started with hydraulic backhoes that were good enough for small contractors looking to dig a small ditch but wholly inadequate for the purposes of a miner. 5.25 inch disk drives were marketed to the nascent market for personal computers and were of no use to minicomputer manufacturers.Disruptive technology is cheaper per unit, but its price / performance ratio is much worse than that of the established technology. It’s not good enough for the clients of the established players. Ergo it must be sold on its (lower) price alone, meaning that its purveyors must seek new markets. Flash memory, for example, was first used in cameras, pacemakers etc. Not in computers!There is a large number of reasons that established players will frown upon the new technology:1. Good companies listen to their clients. Their clients will tell them they don’t want it. They will demand performance and they will pay for performance.2. Profitability will be lower in the lower-margin disruptive technology. Profit margins will typically mirror cost structures and will thus be higher for the higher-end product. Established players will in the short term make more money if they allocate their resources toward not falling behind their immediate competition for the higher-end product. (i.e. “sustaining” their competitive edge in the higher margin / higher tech market)3. The processes used by the established players to sell and support the established technology may not be the right ones for the new tech.The main thing to realize is that the technology does not live by itself. It is embedded in a “value network.” A car serves a commuter, a digger serves a mine, a disk drive is screwed down somewhere in a computer etc. The seeds of disruption lie in the fact that the technology itself and its value network may not necessarily be progressing at the same speed.If the technology is improving much faster than the trajectory of improvement of the “value network” (for example, if the desktop PC users demand extra disk storage slower than the industry is capable of delivering extra disk storage), then1. The point comes when the value network of the established technology does not need the incremental improvements on which the established players are competing with one another to deliver. 2. More importantly, a point comes when the performance of the disruptive technology becomes good enough to be embedded in the value network of the established technology. So 3.5 inch disks developed for laptops can do good enough a job for a desktop, for example, without taking up the space required for a 5.25 inch disk.It gets worse: sure, disruptive technology is deficient in terms of features / performance, but the price sensitive customers who do not care so much about performance often care a lot about reliability. (A small contractor who buys a single backhoe digger cannot afford a maintenance team.) Similarly, the unsophisticated customers of the disruptive technology may care a lot about ease of use. (Mom and pop using Quickbooks have no idea what double-entry book-keeping is!) What this means is that when the performance of the disruptive technology has become good enough for it to be embedded into the value network of the established technology, it often brings with it an advantage in reliability and ease of use.So at that point the disruptive technology is cheaper, more reliable and easier to use than the established technology, all while delivering adequate performance. And that’s how purveyors of the established technology (who have been at war with one another to deliver on the ever-increasing performance their customers have been demanding) find themselves at a disadvantage versus the disruptors when it comes to reliability and ease of use right about when their customers tell them they won’t pay for extra performance or features any more.The disadvantage of the lower-tech disruptor has created an advantage and it’s game, set and match!What’s an established player to do? If I’m running a super successful company and I spot a new technology what am I to do?One thing I should not do is listen to my underlings. The dealers who sell my cars will not want a customer who just walked into the dealership to buy a V8 to drive out in a small electric car. The salespeople will keep asking me for the most expensive product because they will be paid a commission on their margin and will keep pushing me “north-east” on the price / performance chart. Resistance to disruptive technology often comes from the rank-and-file.I also should not listen to my shareholders. Small markets (and all disruptive technology starts small) do not solve the growth problems of large companies.First and foremost, I must understand that the challenge I face is a MARKETING challenge. The tech I’ve got covered. The resources too.If my company’s processes and my company’s values (defined as “the standards by which employees make choices involving prioritization”) are aligned with the marketing challenge, I’m in luck: chances are that for my company this new technology will eventually become a “sustaining” technology. I can get my wallet out and buy EARLY a couple of the new entrants. Early enough that my money is not buying process or values or culture, but merely assets/resources and ideally walking and talking resources (the founders) who will adopt the processes and values of my organization.Alternatively, I can carve out some great people from my organization and:1. Give them responsibility for the new technology and assign to them the task of identifying the customers for this new technology2. Match the size of this new subdivision to the current size of the market.3. Allow them to “discover” the size of the opportunity, rather than burden them with having to forecast it: “the ultimate uses or applications for disruptive technologies are unknowable in advance”4. Let them fail small, as many times as necessaryThat’s what IBM did when they ran their PC business out of Florida and what HP did when they realized ink jets would one day compete with laser printers!If, on the other hand, my company’s processes or my company’s values are not aligned with the marketing challenge, then I need to buy a leader in the new technology, and have a finger in every pie. And I need to protect my acquired company from my organization. This is, obviously, a bigger challenge (and one my shareholders may not embrace, as their dollars are as good as mine, but the author stays away from this discussion!) As the succession in technologies plays out, I will then eliminate large parts of my current organization. The author cites an occasion on which this is exactly how things played out.And there you have it! I think that’s the author’s answer to “The Innovator’s Dilemma”Obviously, that’s a very quick sketch. You’ll have to buy the book to see the complete story (and to be convinced, I suppose). Be warned that in the interest of keeping the various chapters self-consistent you may find some repetition, but overall this is a very quick read.I’m aware of people who really dislike Clayton Christensen. I’ve even come across a Twitter account that’s dedicated to trashing him. But I, for one, was convinced that he’s describing a valid concept with many applications.Also, as a guy who established a disruptive business within an established player I totally experienced both the dismay of my superiors when they realized that “small markets don’t solve the problems of large organizations” and the discomfort of trying to shoehorn my project into the rather baroque established processes. So I have lived through many of the steps the book describes and I reckon they are rendered very accurately. The research shows! It’s been over a year since I got really passionate about learning more about the disruptive innovation after dealing with it on daily basis as a consumer or just simply as a human being. I bought a book ages ago and it was waiting in a line for quite a while. I prefer articles to books I must admit, but felt like I really need to read the book said to be the mandatory theoretical background for entrepreneurs in all domains. It was a hard and a dry read for me I must confess. First, due to academic approach the book takes. Second, due to the cases the study and book is built on (I have neither expertise no any interest in hard disk drive or mechanical excavator industries) . I agree with other reviews saying the book could have been 70% shorter or one can get the idea by just reading the first and the last chapters. So far, I’ve found the concept of sustaining and disruptive innovation quite useful in understanding the innovator’s dilemma and hopefully will avoid the type of ‘good management that can lead to failure’. I believe I will have to re-read it a bit later again more passionately and thoughtfully. So, the information, the ideas would make this a five star book. It's a way of thinking that helps ward off obsolescence, a way of thinking that gets people to understand where future disruption may come from. The whole idea: that good management (like, truely good) eventually leads to poor decisions is fascinating.The example: If current customers demand "faster horsers" companies rightly put their energy into faster horses. What the customer says and wants isn't necessarily what's good for the company. Meaning: everyone wants something and they lie about their wants.This book is about how to differentiate between "Sustataining innovation" (more megabytes) and "disruptive innovation" (a different form factor, a different approach. )This would score very poorly on the "Flesch Reading Scale," and I found the writing to be opaque at times - it's easy to write sentences with multiple qualifiers . It's more difficult to write like the Heath Brothers. Well, this is a mixed bag, this interesting little book. The observations are prescient but the presentation is abominable. I'm sure for those who demand an exhaustive regurgitation of every step in an analysis, it is useful, but I felt that most of the book could have been the research appendices. On the other hand, the conclusions drawn were incisive and incredibly useful. It would have worked well if it had been presented as a research paper with a 10-page abstract. As a practitioner, I could be pretty hard on it because it's missing application, but I get that it was meant to be more academic in its approach, and I'm big enough to draw my own conclusions about implementation. Very dry read. Very good analysis. If you are sick of hearing cliches like - "The customer is always right", this book is for you. The author Clayton Christensen who is very well known for his research, takes examples of industries like disk drive, excavation and such to demonstrate how successful and innovative companies fail precisely because they listen to their customers. The author proves that getting customer feedback, tracking competition, allocating resources carefully, using tried-and-tested processes, all hallmarks of good management eventually kill the spirit of disruption. He also talks about how experts that try to predict disruptive technologies fail miserably. Successful companies are aware of disruptions and some of them do build disruptive products in parallel with existing ones, but because of small margins they get by selling disruptive products in insignificant markets, those products do not get the limelight resulting into companies missing their market share. The dilemma that the author refers to is two-fold -1. The value to innovation S-curve: Developing a product takes iterations. Early iterations provide less value but as product matures, the values raises exponentially. At some point, all valuable additions to the product are complete, and value per iteration goes down again. For this reason, customers of successful companies are not interested in new / disruptive products, instead they focus on innovating existing products. Newcomers on the other hand do not have this obligation, and they go deep into the S-curve, thereby providing great value to their customers.2. Newbies vs. existing players expectations: Existing companies have to keep up with high expectations of their share holders while newcomers can pursue a small segment of the market. Newcomers do not have to satisfy their investors or increase sales. This allows them to focus on innovation.This is a very insightful book and even if you are not into management, it is very useful. My only problem is the highly redundant and academic style of narration. Perhaps, the author could have made it friendlier for non-management folks, but a good read nevertheless! A pretty convincing argument for why large, established companies struggle to keep up with disruptive innovations. It turns out that the very things that make those companies dominant in an existing market work against them when considering new markets. As the pace of disruption accelerates, the lessons in this book become more and more important. Less convincing are the solutions the book proposes and, at an even more basic level, how to distinguish between what the book calls "sustaining innovations" and "disruptive innovations". It seems that the definitions rely on hindsight (ie, a disruptive innovation is one that turns out to, uh, disrupt the leaders) and are not particularly predictive. And since the solutions the book proposes only work for the disruptive ones, this is a rather big weakness.Still, the book is worth reading for building your awareness and vocabulary around these issues. The writing is a bit dry and academic-sounding, but there are plenty of good examples that, if you've ever worked at a large company, will feel all-too-familiar.Some good quotes from the book:First, disruptive products are simpler and cheaper; they generally promise lower margins, not greater profits. Second, disruptive technologies typically are first commercialized in emerging or insignificant markets. And third, leading firms’ most profitable customers generally don’t want, and indeed initially can’t use, products based on disruptive technologies. By and large, a disruptive technology is initially embraced by the least profitable customers in a market. Hence, most companies with a practiced discipline of listening to their best customers and identifying new products that promise greater profitability and growth are rarely able to build a case for investing in disruptive technologies until it is too late.While managers may think they control the flow of resources in their firms, in the end it is really customers and investors who dictate how money will be spent because companies with investment patterns that don’t satisfy their customers and investors don’t survive. The highest-performing companies, in fact, are those that are the best at this, that is, they have well-developed systems for killing ideas that their customers don’t want. As a result, these companies find it very difficult to invest adequate resources in disruptive technologies—lower-margin opportunities that their customers don’t want—until their customers want them. And by then it is too late.With few exceptions, the only instances in which mainstream firms have successfully established a timely position in a disruptive technology were those in which the firms’ managers set up an autonomous organization charged with building a new and independent business around the disruptive technology. Such organizations, free of the power of the customers of the mainstream company, ensconce themselves among a different set of customers—those who want the products of the disruptive technology.In dealing with disruptive technologies leading to new markets, however, market researchers and business planners have consistently dismal records. In fact, based upon the evidence from the disk drive, motorcycle, and microprocessor industries, reviewed in chapter 7, the only thing we may know for sure when we read experts’ forecasts about how large emerging markets will become is that they are wrong.Simply put, when the best firms succeeded, they did so because they listened responsively to their customers and invested aggressively in the technology, products, and manufacturing capabilities that satisfied their customers’ next-generation needs. But, paradoxically, when the best firms subsequently failed, it was for the same reasons—they listened responsively to their customers and invested aggressively in the technology, products, and manufacturing capabilities that satisfied their customers’ next-generation needs. This is one of the innovator’s dilemmas: Blindly following the maxim that good managers should keep close to their customers can sometimes be a fatal mistake.My findings consistently showed that established firms confronted with disruptive technology change did not have trouble developing the requisite technology [...] Rather, disruptive projects stalled when it came to allocating scarce resources among competing product and technology development proposals [...] Sustaining projects addressing the needs of the firms’ most powerful customers [...] almost always preempted resources from disruptive technologies with small markets and poorly defined customer needs.Successful companies want their resources to be focused on activities that address customers’ needs, that promise higher profits, that are technologically feasible, and that help them play in substantial markets. Yet, to expect the processes that accomplish these things also to do something like nurturing disruptive technologies—to focus resources on proposals that customers reject, that offer lower profit, that underperform existing technologies and can only be sold in insignificant markets—is akin to flapping one’s arms with wings strapped to them in an attempt to fly. Such expectations involve fighting some fundamental tendencies about the way successful organizations work and about how their performance is evaluated.One of the dilemmas of management is that, by their very nature, processes are established so that employees perform recurrent tasks in a consistent way, time after time. To ensure consistency, they are meant not to change—or if they must change, to change through tightly controlled procedures. This means that the very mechanisms through which organizations create value are intrinsically inimical to change.In order for a $40 million company to grow 25 percent, it needs to find $10 million in new business the next year. For a $40 billion company to grow 25 percent, it needs to find $10 billion in new business the next year. The size of market opportunity that will solve each of these companies’ needs for growth is very different. As noted in chapter 6, an opportunity that excites a small organization isn’t big enough to be interesting to a very large one. One of the bittersweet rewards of success is, in fact, that as companies become large, they literally lose the capability to enter small emerging markets.Disruptive technology should be framed as a marketing challenge, not a technological one. Clayton Christensen is to the study of innovation what Thomas S. Kuhn is to science. Kuhn's "normal science" is analogous to Christensen's "sustaining innovation", and "scientific revolutions" is like "disruptive innovations". Kuhn sees progress in science not as the discovery of new phenomena, but as fitting existing "anomalies" into a new "paradigm". Christensen too sees disruptive innovation as finding new markets for existing technologies. I'm sure the analogy can be taken further, but in short, both will change the way you think about how innovation progresses. Just as with Kuhn's book The Structure of Scientific Revolutions, I felt that Christiensen belabours his point a little too much, yet each chapter adds a few good points - like the Resource/Process/Values framework, or watching your customers rather than listening to them, and many others I cannot recall.If you like business books, this one is a classic. It does feel outdated at times until you think about how its lessons are still applicable today yet so frequently neglected. A must read theory for anyone who is into Problem Identification. Basically everyone :) I started this book 3 years back, read 25-30 pages and gave up as I did not found it interesting. I started it again last month, but now I already read 2 other books by the same author, just to realize that the language in this book was too tough for me to understand 3 years ago mainly because of my level of understanding. As I have mentioned in the reviews of other books by Clayton Christensen, the theory in this book is a very fundamental one which deals with WHY-of-X. While reading, I was applying this to other areas of my life apart from Business (which is the context of the book), like communication skills, relationships, personal learning etc and they are so true! If you want a full grasp of Clayton's theory, read his all three books and you will feel the dots-are-connecting effect, giving you a 360-degree view of looking at a situation in every aspect of your life. Pretty boring. Basically 250 pages of somewhat-repetitive research. This is a summary I wrote for class.Although disruptive technologies are "typically simpler, cheaper, and more reliable and convenient than established technologies," the greatest firms often adopt them in ways and at times that cause them to lose millions or billions of dollars in revenue. This seems ironic, because successful large firms have the resources to develop, and even develop markets for, new tech. Too frequently, however, these firms are slow to move into risky areas when they do not perceive a competitive advantage. Many examples are given, like the electric-powered car, disk drive, and steam shovel industries. In each of these examples, a revolutionary, disruptive technology was developed and eventually needed to be integrated into industry leaders' portfolios. Whether through acquisition or internal development, these companies always did adopt the technology, but they often did it late, halfheartedly, or without the proper market research, missing out on potential revenue and huge chunks of market share. Christensen's book suggests that spinning off an independent organization to develop and market the technology, even if customers may not relate it back to the parent company, is often a successful strategy for these great firms to use. These independent organizations are more organic and therefore can navigate into new markets faster, with more success and less risk because of the parent company's resources. Additionally, disruptive and sustaining technologies often need different strategies, so choosing one strategy to take in regards to innovation will not always lead to the greatest market share. This is one of those books that so many people mention/name drop that I just had to read it to see what it was all about. (Next on the list: Game of Thrones). It was well worth the read.In the Innovator's Dilemma, Christensen argues that in some cases the reason why good, solid companies fail to stay ahead of the competition is not because they are incompetent, but because their structures/ processes/ incentives are all geared towards managing "sustaining technological change", as opposed to "disruptive technological change". When disruptive technologies emerge, the market for them is often not clear. The performance specs of these disruptive technologies do not meet the needs of companies' existing customers (e.g. in terms of capacity for disk drives) but have other attributes (e.g. physical size) that could potentially be of value to other (as yet undefined) markets. But in good companies, their processes are geared towards developing products that will meet the needs of their existing customers. Moreover, these firms are embedded in a larger "value network" that encompasses both customers and suppliers geared towards meeting the needs of existing customers. Small emerging markets also do not address the "near-term growth and profit requirements of large companies". These companies are therefore great at managing sustaining technological changes but poor at handling disruptive technological change. To manage disruptive technological change, therefore, Christensen asserts that managers need a fundamentally different approach - "discovery-driven planning", i.e. planning to learn vs planning to execute. Assume you don’t know anything for certain. Be clear what are the assumptions upon which your plans or objectives are based. Test these assumptions. This requires you to ensure that your strategy will allow you to make shifts and adjustments as necessary and that these shifts are not costly. The most insightful chapters for me were Chapt 8 on "How to Appraise Your Organisation's Capabilities and Disabilities" and Chapt 10 on "Managing Disruptive Change: A Case Study". In Chapt 8, Christensen breaks down how managers can assess the ability of their organisation to manage different kinds of innovation by looking at (i) the kind of resources it has; (ii) the mechanisms/processes by which the organisation creates value, which is "intrinsically inimical to change" in order to ensure consistency; and (iii) the values of the organisation that employees use to make prioritisation decisions. Christensen notes that "the larger and more complex a company becomes, the more important it is for senior managers to make independent decisions about priorities that are consistent with the strategic direction and the business model of the company....[but these] clear, consistent and broadly understood values, however, also define what an organisation cannot do." Dealing with disruptive change therefore requires managers to create new capabilities, whether by acquiring an organisation whose processes and values match the new task (and keeping them separate from the existing organisation) or separating out an independent organisation and developing within it the new processes and values required. In Chapt 10, Christensen takes us through a step-by-step guide of how he might hypothetically think about managing the potential disruption posed by electric vehicles, if he were a manager of an auto maker. First, assessing whether electric vehicles represent a disruptive change, based on whether their trajectory of improvement might some day make them a viable option for the mainstream market, i.e. will the trajectory intersect the trajectory of market demands. Second, finding a potential market for the vehicles, by getting out there and trying to sell the product to different kinds of customers to see what hooks. Third, having a strategy to learn (or rather, to fail, fail fast and try again). This entails conserving resources for multiple iterations, rather than putting all of one’s resources in designing the perfect product the first time round.Although Christensen’s book looks at the commercial sector, you can apply the insights from the book to other domains, including the public sector. What might it mean for the public sector to manage disruptive change, in the way organisations and teams are set up and resourced? What might a strategy for learning mean in the context of designing public services and infrastructure? In IT for instance, might it entail a shift away from the “waterfall” method of designing infrastructure towards the agile methodology? God, business books can be so dense and boring. While I do believe Clayton Christensen is right on the money with his hypothesis, framework and careful (OH SO CAREFUL) curation of case studies in disruptive/innovative tech and business, I really wish he and his editor worked together to make this a bit more easily digestible. My favorite break down was towards the end with exemplifying electric cars versus gas cars and drawbacks. Because the metaphor and case studies were more current and recent, the premise was much easier to grab onto than disc space and computer case studies. When you have an established product, listening to your customers cannot keep someone from disrupting your market. The technology will rise form smaller previously unserved markets and then expand into yours. And then the same thing will happen to them. The way to solve this is to build enterprise startups that sell to anyone they can. Anyone who wants the product regardless of market size.When technology improves faster than market demand for quality eventually a new technology will rise from below that satisfies the previous key metrics well enough that differentiability moves to other metrics.The distinction between disruptive innovation vs. radical innovation. One is unforeseen by the customers while the other is in line with their ever increasing demands.You must be the one to cannibalize your own sales.Quotes:"First, disruptive products are simpler and cheaper; they generally promise lower margins, not greater profits. Second, disruptive technologies typically are first commercialized in emerging or insignificant markets. And third, leading firms' most profitable customers generally don't want, and indeed initially can't use, products based on disruptive technologies. ""Small markets don't solve the growth needs of large companies: To maintain their share prices and create internal opportunities for employees to extend the scope of their responsibilities, successful companies need to continue to grow. But while a $40 million company needs to find $8 million in revenues to grow at 20 percent in the subsequent year, a $4 billion dollar company needs to find $800 million in new sales. No new markets are that large. ""Principles of disruptive innovation:1. Companies depend on customers and investors for resources2. Small markets don't solve the growth needs of large companies3. Markets that don't exist can't be analyzed4. An organization's capabilities define its disabilities5. Technology supply may not equal market demand""The fear of cannibalizing sales of existing products is often cited as a reason why established firms delay the introduction of new technologies. ""These companies did not fail because the technology wasn't available. They did not fail because they lacked information about hydraulics or how to use it; indeed, the best of them used it as soon as it could help their customers. They did not fail because management was sleepy or arrogant. They failed because hydraulics didn't make sense - until it was too late. ""While senior management may think they're making the resource allocation decisions, many of the really critical resource allocation decisions have actually been made long before senior management gets involved: Middle managers have made their decisions about which projects they'll back and carry to senior management - and which they will allow to languish. ""They panned to fail early and inexpensively in the search for the market for a disruptive technology. They found that their markets generally coalesced through an iterative process of trial, learning, and trial again. ""Watching how people use products, rather than by listening to what they say." Incredible analysis of how disruptive technology works. Fundamental insight that companies that get disrupted generally get disrupted BECAUSE of good management is a key understanding for just about any corporate worker. This happens because good management teaches you to listen to your customers, make higher-cost / higher-margin products, and invest capital behind plans with relatively confident financial projections. However, disruptive technology that upends industries typically starts cheaper / lower margin, is not something customers know to ask for, and has no way to hold to precise financial projections. Therefore, good managers will tend to dismiss / ignore disruptive technology until it's too late.Also a great read for start-ups as a great lens through which to think about how you will enter big markets with mature incumbents. 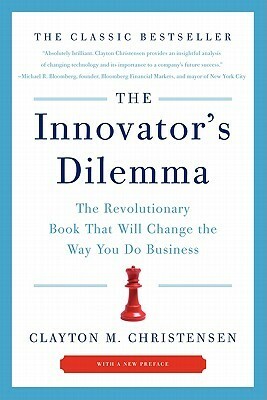 Although I wonder whether my copy was complete - it seemed quite short - this is a powerful and important work for anyone in business.Christensen, in this version of The Innovator's Dilemma demonstrates why great firms fail when new technologies come along. The spoiler is that it's because great firms (those with great teams, excellent management, etc) are not actually driven by the company. They're driven by customer demand. Customers (and stakeholders) are those who cause things to happen inside companies, because going against their wishes causes business to fail.And yet, those conditions are not what innovative companies need. New technology can't emerge from great firms, argues Christensen, because new technology requires thinking about things that customers don't need. It requires different thinking, different management. It's the difference between writing strategic plans on the strength of trends and going to market with no idea about the people who will buy, no ability to forecast, and a strong, iron gut that will withstand failure.The great firms who have introduced new technologies, according to Christensen's analysis, are those who don't do it within the mainstay of the firm. Instead, they invest in setting up (or buying) early stage companies, those who can profit from small markets, and for whom small markets are meaningful. They use those companies, as independent beasts, to introduce, test, and sell new technology. This pattern is visible all throughout the case studies and examples provided. Part of the reason is that great firms, large companies with huge revenues, can't withstand the risk of not servicing their business. Forecasts and growth patterns demand a massive amount of business; small markets are of absolutely no use to them. But for emerging companies, it's perfect.The lesson in this work is that if you have a company with significant revenues, you absolutely must introduce new technologies if you want to maintain your position. But to do that, you have to set up (or acquire) small concerns and allow it to run independently of your core business, and (in some cases) even become a competitor to your main business. Either way, you win: Ultimately your parent company owns the innovation and any wins that come its way.Fascinating read, and absolutely essential for anybody thinking about disruptive technology. It will also open your eyes to the fact that all these old boilers of companies, who are currently talking about innovation, likely won't succeed in disrupting anything. Not, that is, unless they are capable of doing that outside of the mainstay of their core business. Good argument, highly redundant.The central argument is that companies miss important new markets because they are structured to serve the needs of their most profitable customers where new 'disruptive' technologies often emerge from smaller markets who's customers needs are quite different. Eventually the smaller market catches up to the demands of the profitable customers and by that time has developed an insurmountable lead in the utility that its original customers demanded.The prime example of this kind of 'disruptive technology' is seen in disk drives where smaller low-cost, low-power technologies have consistently replaced larger more efficient disks. The new disks appealed to customers who needed less power and values the lower cost and size. As Christensen points out, existing companies have consistently missed these changes because their top customers continued to demand storage / $ until the 'disruptive' new technology eventually caught up with that demand.The same general pattern repeats itself in the steel industry and computer markets. It also repeats itself in Christensen's book which could easily have been 70% shorter w/o loosing any of its message. Still the basic point is great and it leads to some interesting ideas and recommendations:1. Well structured companies will work to please their top customers regardless of executive orders.2. Top customers might have different needs from smaller customers.3. Smaller markets require nimbler company structures to enter. Big companies will find the benefits too small to justify their entry. The potential profitability of emerging markets is nearly impossible to assess correctly and so big companies can easily miss these waves.4. As smaller markets grow their is the risk that they will overwhelm bigger markets once the big market's performance needs are met. This is usually because they provide a cheaper, and easier to use product.5. Often engineers are the only people in a company who anticipate the emergence of 'disruptive' technologies. In many cases their fights with marketing have led them to form new companies that end up usurping the companies they came from. If these engineers were funded by the company they came from and given the degree of independence necessary to succeed they might benefit the companies who cultivated their success. Biggest question is - how do you figure out something is a "disruptive" technology, not just a fringe/inefficient one. Only somewhat answered by the book - a lot of gut feel goes into that one I guess.In a way, a tech is disruptive if after building a startup or division around it, you can find a segment of the market that's growing at a fast enough rate to fuel more innovation in this technology, until the new market starts to get big enough to rival the original market. Or if your competitors do this. There's no way to identify the technology as such except if you try your best to do this and succeed and fail.Conclusion: as a large company, you must create tiny spin-off startup-like departments to chase down wild ideas, and they must be allowed to fail w/o major repercussions to their careers.--Highlights from the book below--What is disruptive technology? "innovations that result in worse product performance, at least in the near-term""disruptive technologies underperform established products in mainstream markets. But they have other features that a few fringe (and generally new) customers value"Why do companies fail? "Established companies that investing aggressively in disruptive technologies is not a rational financial decision for them to make"The thing to watch out for is when the basis of competition shifts to a different metric: features -> performance -> stability/convenience -> priceA large company is entrenched with its biggest customers and the things that are important. It is hard as a company to go from caring about, say, deep rich feature set to having a sloppy feature-poor product that's a lot more convenient, for example. "Performance oversupply is an important factor driving the transition from one phase of the cycle to the next"
I had expected the book to be about the challenges for an innovator entering a new market. But to my utter surprise, it was about the dilemma face by established innovative companies in the market.The key takeaway is the difference between a radical and a disruptive innovation. Most people confuse the two. Moreover, it also demonstrates that the leading cause of failure of established firms to disruptive innovations is not poor management. These firms had excellent managers, sound financial policies, and in some cases were the first to develop the prototype of the disruptive innovation. But since disruptive innovations are cheaper and simpler products that sell in small niche markets with lower gross margins, they just weren't attractive enough to the established firms. Sustaining (incremental and radical) innovations promised more guaranteed returns and higher margins. With time, the disruptive innovations improved and toppled the established firms. Now that the established firms know how it pans out, do they invest in the unattractive small margin disruptive innovations (extremely difficult to sell this to their investors) or in guaranteed sustained innovations. This is the dilemma. Not only does Clayton outline the issue with sound research but also provides the solution. There is a case study in the last chapter that demonstrates how to implement the solution in your own firms when faced with this quandary. It's a definitely worth a read so that these mistakes aren't repeated. In my opinion mandatory theoretical background for entrepreneurs in all domains. Professor Christensen proposes a catchy theory (backed by solid evidence) that innovation in existing companies is not enough when pursued only to get greater sells/better margins. He says that there is a second type of innovation that, if left unnoticed by big companies, can lead them to failure. This second type of innovation also creates market place for smaller companies for which smaller profits are good enough.The book is really easy to read, the first half is filled with theory and backing data from disc drive companies, excavator companies, and alike, and even though the data is not up to date, it feels that it doesn't really matter. I could immediatelly apply the theory to my company and it fells like I see much more clearly the steps our senior management does.The second half of the book are mostly real stories that not surprisingly confirm the innovation theory. This part doesn't bring anything new, but gives some time to organize your thoughts about the first part.When you are finished reading this book, i'd recommend The Lean Startup: How Today's Entrepreneurs Use Continuous Innovation to Create Radically Successful Businesses, which into greater detail explains how to fail fast and do the marketing before you even have an existing product. Clayton M. Christensen - Clayton M. Christensen is the Robert and Jane Cizik Professor of Business Administration at the Harvard Business School, with a joint appointment in the Technology & Operations Management and General Management faculty groups. He is best known for his study of innovation in commercial enterprises. His first book, The Innovator's Dilemma, articulated his theory of disruptive technology.Christensen was born in Salt Lake City, Utah, the second of eight children. He holds a B.A. with highest honors in economics at Brigham Young University (1975), an M.Phil. in applied econometrics and the economics of less-developed countries at Oxford University (1977, Rhodes Scholar), an MBA with High Distinction at the Harvard Business School (1979, George F. Baker Scholar), and a DBA at the Harvard Business School (1992).Clay Christensen lives in Belmont, Massachusetts with his five children, wife Christine, and is a member of The Church of Jesus Christ of Latter-day Saints. He has served in several leadership positions in the Church. He served as an Area Seventy beginning in April 2002. Prior to that he served as a counselor in the Massachusetts Boston Mission Presidency. He has also served as a bishop. He speaks fluent Korean.Christensen is currently battling follicular lymphoma.For further details and an ordered list of the author's works, see the author's Wikipedia page.